THURSDAY night saw the official launch of Athmhúscailt an Fhathaigh (Re-Awakening the Giant) in a packed Gael-Ionad Mhic Goill, the hub of Upper Springfield based Irish medium youth and community organisation, Glór na Móna. This environmental youth heritage project, was funded by the Heritage Lottery ‘Young Roots’ scheme and lasted 12 months, engaging over 150 young people from the Upper Springfield, and further afield. 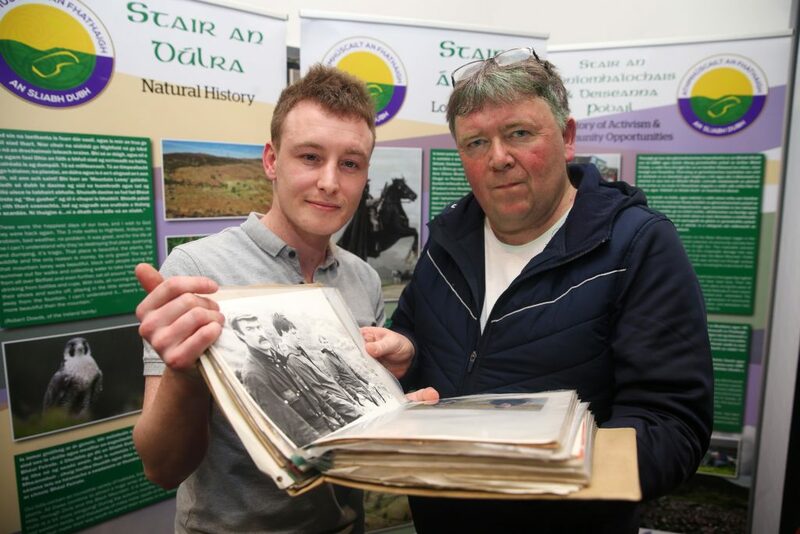 Celebrating over 35 years of steadfast activism on the Black Mountain, and honouring those who committed their voluntary time and effort to halt quarrying on the Black Mountain – the Glór na Móna youth team shone a light on past victories and took the opportunity to reflect on this unique heritage and make it accessible and available to the community again. The event saw the launch of a new community archive website, featuring digitised material from the Terry Enright Community Archive and the Belfast Hills Partnership Archive, alongside the launch of new community documentary, An Fathach (The Giant).